This Bed & Breakfast was born a few years ago with the desire to share this beautiful place with all lovers of relaxing holidays. 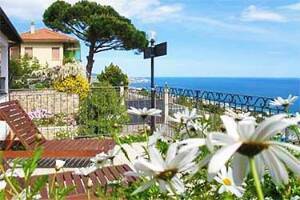 We are in a hilly position that offers a beautiful view of the Gulf of Sanremo, in the green, with the convenience of being able to reach the city centre and the sea in a few minutes by car. Year after year weI try to improve the environment by listening to the advice and wishes of those who decided to spend their holidays here with us.